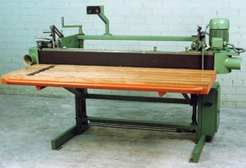 Wood sanding machine is used for sanding plane surfaces, edges of scutiform components and bars, also for surfaces of various curvilinear components. 1. Planes are ground by means ofpressing an abrasive band with a captive pressure pad. After removing a smoothing beam finisher with a pipe quide, the band can be pressed by a hand pressure pad. 2. The bars are ground on an upperplane ofa sanding head to a required angle. 3. The edges are ground by means of tuming a sanding head to a required angle. 4. The curvilinear surfaces are ground with a head removed.